FREE forever! No nag screens. 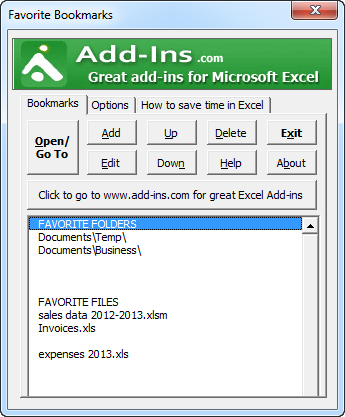 The Favorite Bookmarks add-in for Microsoft Excel allows one to create a list of favorite directories and favorite workbooks and quickly and easily open them. It is compatible with Microsoft Excel 2007 to 2019 and Office 365. To open a file or a folder, one just selects it in the list and clicks on the Open/Go To button. Or one can double click a bookmark to open it. Options allow you to keep the Favorite Assistant dialog open or have it close automatically when you open files. Other options allow one to resize the dialog so you can see more bookmarks and make the dialog wider. Multiple files in different directories may be opened at one time. In addition, one can add blank rows, labels, and move bookmarks up and down to arrange them in any order you want. We are giving away Favorite Bookmarks to illustrate how one can save time using our add-ins for Excel. Favorite Bookmarks is just one feature of one of our add-ins, the Spreadsheet Assistant. The Spreadsheet Assistant adds over 200 time saving features to Excel. The features are fully integrated with the Excel menus for ease of use.